It’s that time of year again and wedding bells are in the air. Weddings and parties are an expensive business, so I thought it might be a good time to show you how to easily and cheaply make vintage wedding invitations. Some good friends of mine got married recently, and were struggling to find the exact type of wedding invitations that they wanted for the price that they could afford. 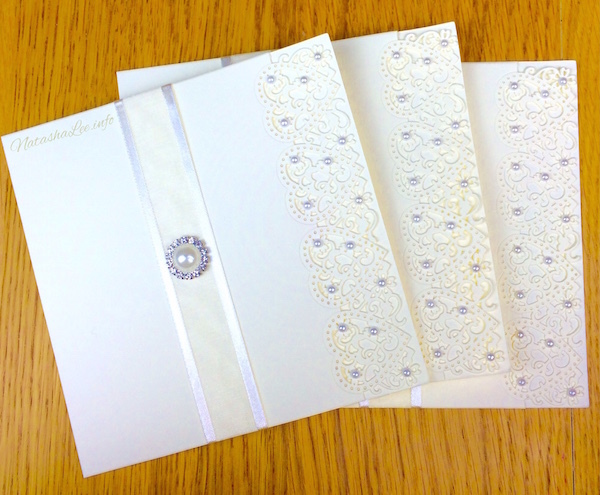 As part of their wedding gift, I offered to make the invitations for them to create exactly the type of invitations they really wanted – ivory and gold vintage lace invite with hearts, diamonds, pearls and ribbons. Before I started, I thought that it would be a great opportunity to share with you how to easily make vintage wedding invitations or party invitations. I’ve seen similar style hand crafted invitations on Etsy which can cost at least £8.95 each without personalisation, but I’m going to show you how to create beautiful and easy personalised cream and gold, vintage lace wedding invitations, for only £1.83 each, which is a saving of 80%! 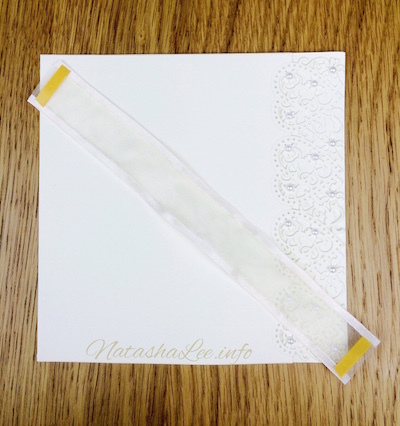 You can alter these invitations to suit any colour scheme that fits your occasion just by changing the colour of the ribbon and the insert paper. The total cost to make 60 vintage wedding invitations is £109.87. This works out at only £1.83 per invite, a saving £7.12 per invite compared to similar invitations on Etsy for £8.95 each excluding personalisation! Begin by applying your self-adhesive pearls to your invitation. I find the most balanced look was to apply them to the centre of the heart lace scrolls, which means that you will be using 17 pearls per invite. Next, take your ribbon and cut it into pieces of 20cm. You will be able to get 20 pieces (so 20 invites) per 4m roll. Using your Double Sided tape, put a little double sided tape on each end of the ribbon about three-quarters the width of the ribbon. Turn the ribbon over so the double-sided tape is facing away from you. Lie the ribbon vertically down the centre of the card with an overlap of 2.5cm each at the top and bottom. Remove the backing from one of the pieces of double-sided tape and opening the card slightly, bend it over the front of the card and press down to stick it to the inside of the card. Open the card up. Remove the backing from the remaining piece of double sided tape. 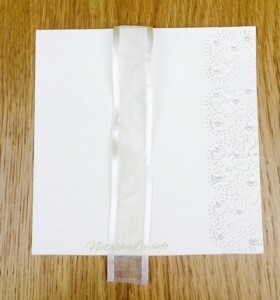 Pull the ribbon to remove any slack, and ensuring that it has remained vertical, attach to the inside of the card. Now you are ready to finish off the front of your homemade wedding invitation, close the invitation with the front facing up towards you, apply a little glue to the back of your diamond & pearl brad. Don’t use too much glue otherwise it will spread out and seep up the ribbon threads. 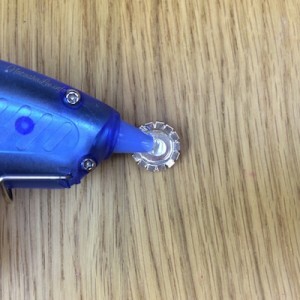 I love my cool touch glue gun which I’ve had for years and is a safer alternative to use around pets and children. 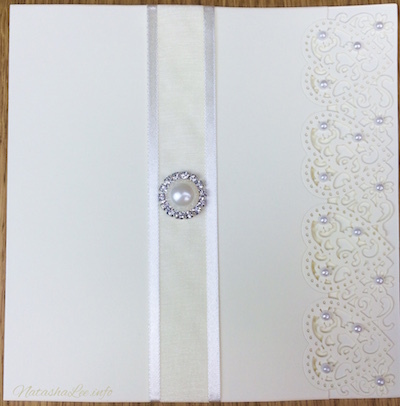 Place the diamond and pearl adornment in the centre of the ribbon, equal distance between the top and bottom of the card. Now you are ready to begin the inside of the card, you need to have decided your wording. You will need to have suitable wedding invitation wording and details on the inside of the card depending on who is hosting the wedding etc. You can find a selection of Wedding Invitation Wording at the bottom of the page. You may also want to include details of your gift registry, or alternatively, a nice poem about wanting money instead of gifts. This may well be the case if you (like my friends 😉 ) have been “living in sin” for a number of years prior to marriage. Again an example of this is available at the base of the page. For a nice balanced invitation, I’d recommend the official wedding invitation wording is placed on the inside right, and the gift registry/poem on the inside left. 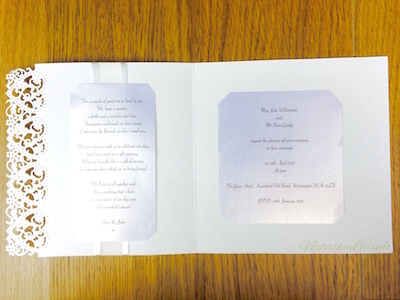 I find it easiest to use a computer programme like Word, Open Office or Pages, to produce your perfect printed inserts, as you can ensure that each invite is the same and there is minimal paper wastage. If you are using 15cm x 15cm card blanks for your invite like those in this craft blog, then you can only really fit 4 wedding inserts on an A4 piece of paper. Open up a new document, change the layout to Landscape, go to “insert table” and insert a table with a total of 4 cells (2 columns and 2 rows). 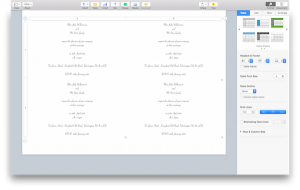 Edit the size of the table so that it covers an A4 page. You may need to add your wording first to each cell in order to do this, and I would recommend reducing your page borders if you have a lot of wording to include. Ensure that the wording is centred in each cell, and edit the font style and colour to suit your tastes and wedding theme. Print out on your Pearlised Paper in multiples of 4, depending how many invites that you are making. 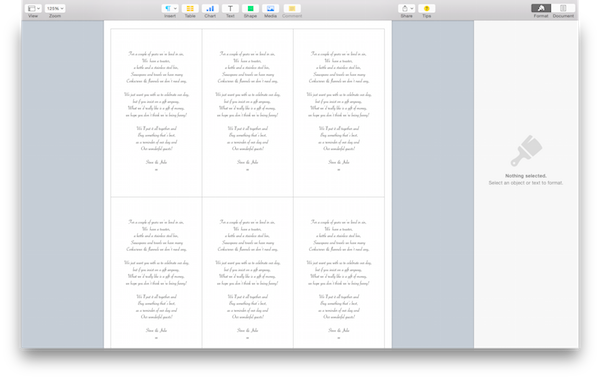 For 60 invites, I needed 15 pages to get enough wording for each invite. Repeat this process again for the wedding poem / gift registry details. This time you may be able to fit 6 lots of gift wording on an A4 page. Again print out in multiples of 6, so I needed to print 10 pages in order to have enough poems for 60 Wedding Invitations. 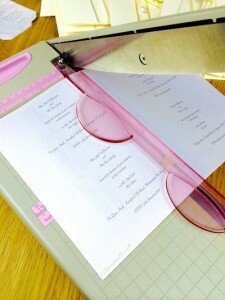 Using the table grid lines as a guide on your printed paper, cut out your vintage wedding invitation wording, and gift registry/poem wording. You can just use scissors for this task, but it’s much quicker, easier and neater if you have a guillotine or paper trimmer. 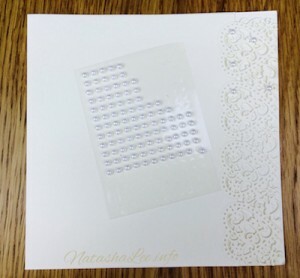 Once you’ve cut all of your wedding inserts neatly, it’s a nice touch to trim off the corners and gives a more professional look and feel for the finished invitation. 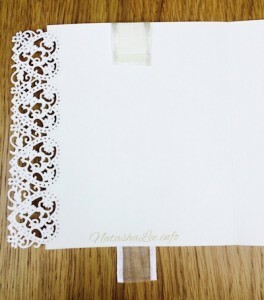 Using your double-sided craft tape, add a strip to the top and bottom of each insert. 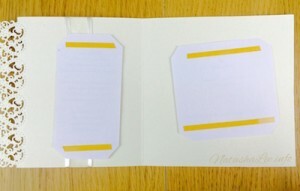 Place the inserts the right way round on the inside of the card to check your positioning before removing the tape backing. 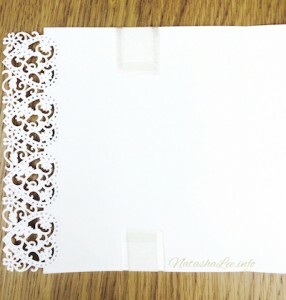 Remember if you are using card blanks with a lace detail on the side, to place the wedding wording slightly offset from the centre so that you cannot see it when the card is closed. Remove the tape backing, and place into position. Your gift registry / poem wording should cover the area where the ribbon has been stuck down, producing a really neat and professional finish. 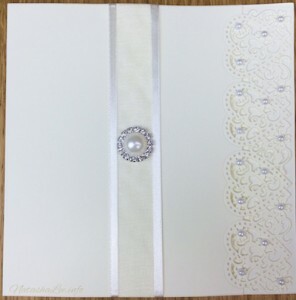 And here are your finished cream & gold vintage wedding invitation with pearl and diamond detailing! 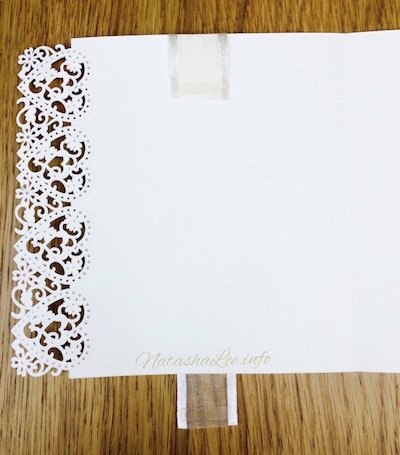 Really effective and beautiful, but wonderfully easy enough for even craft beginners to be able to make vintage wedding invitations for your own wedding, or as a gift for someone else. 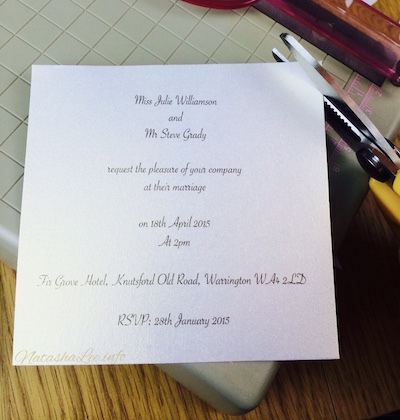 It can be a bit of a minefield creating your own wedding invitations as it’s hard to know what is the right wording. 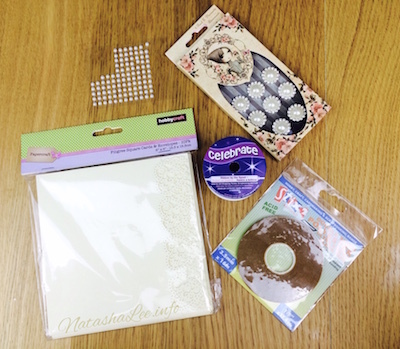 Here is a quick guide to help you when creating your own homemade wedding invitations. You can easily alter how formal or informal your wording is just by changing a couple of words. Corkscrews & flannels we don’t need any.